On May 25, 2017, the Census Bureau released its 2016 annual population estimates for subcounty geographic units. This granular level of detail allows us to look more closely at where population change has occurred across the state. As a whole, Wisconsin gained an estimated 91,419 people between July 2010 and July 2016—including 10,817 in the year ending July 2016. But these headline numbers obscure major variation across the state. Of the more than 1,850 cities, towns, and villages making up Wisconsin, 833 grew since 2010 and 986 of them shrank. Smaller places tended to get smaller, while bigger places got bigger. In 2010, 70 percent of the state lived in municipalities which would grow in the next six years, compared to just 30 percent in municipalities that would shrink. Much of this loss was concentrated in the northern region of the state, with the notable exception of several communities in Douglas County near Duluth, MN. 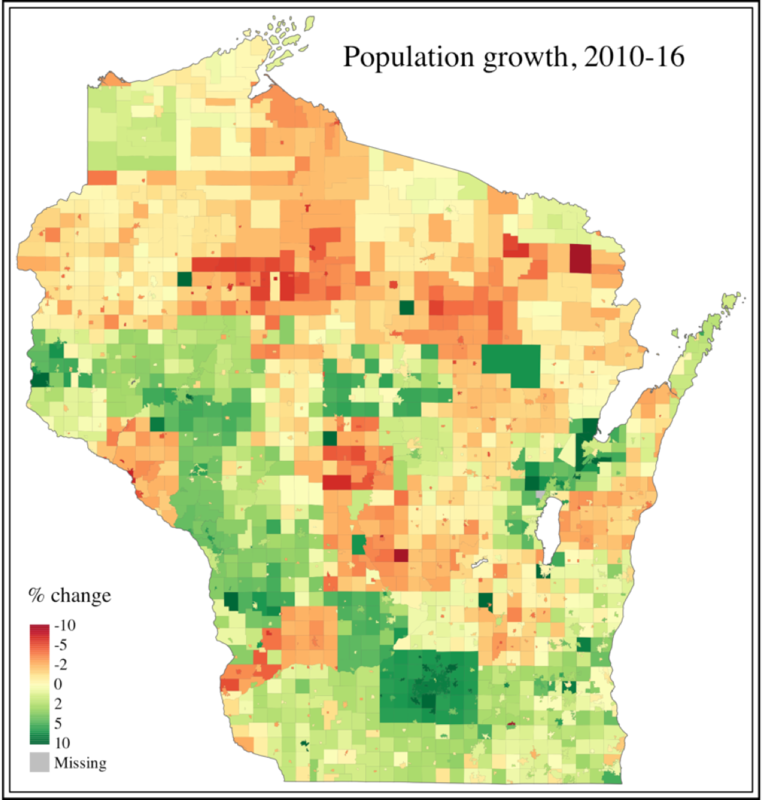 The map above shows the percent change in population for each Wisconsin municipality from 2010 to 2016. 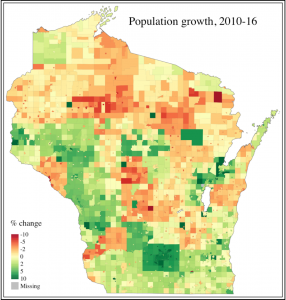 The Green Bay/Appleton and greater Madison regions saw some of the highest growth, with additional sustained growth occurring in the Western part of the state including La Crosse, Eau Claire, and the Minneapolis/St. Paul suburbs. Nearly all portions of Marathon County surrounding Wausau have also experienced growth since 2010, although the City of Wausau itself declined marginally. This stands in stark contrast to nearby Rusk County, which lost 4 percent of its total population over the same time period. The only county to fare worse was neighboring Price County where the population declined by 4.5 percent. Dane County fared best with 9 percent growth, followed by tiny Menomonee (7 percent) and Green Bay area Brown County (5 percent). Applying the same scale to just the past year’s change reveals similar, though necessarily less severe, trends. From 2015 to 2016 the City of Milwaukee lost an estimated 4,300 people, or about 0.7 percent of its population. Combined with a minor decline the year before, this essentially wiped out the city’s slight growth from 2010 to 2014. 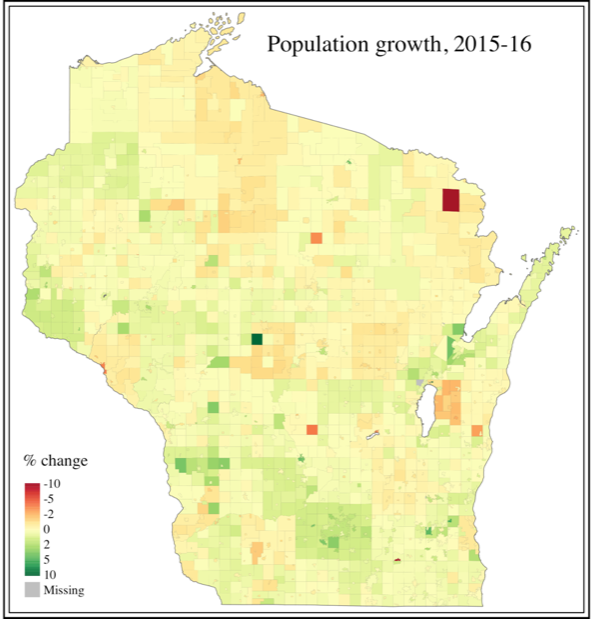 Despite stagnant population size in places like Milwaukee and Wausau, Wisconsin’s growth is driven by its most populous communities. Municipalities with populations of at least 10,000 grew an average of 1.5 percent from 2010 to 2016. Municipalities with less than 1,000 residents shrank an average of 0.5 percent. Estimates are for July 1 of each year. I use the Census Bureau’s July population estimate base for 2010, not the decennial census. The technical unit of measurement in the map is Minor Civil Division (MCD), which corresponds with Wisconsin’s municipalities except in situations where municipalities cross county lines. In those rare cases, each county’s portion of the municipality is measured and mapped uniquely. Statistics in the report, however, reflect the total figures for each municipality.